The preceding weather chart displays the Mendoza weather averages. The red line displays the monthly day time maximum temperature while the blue line shows the average night time minimum. 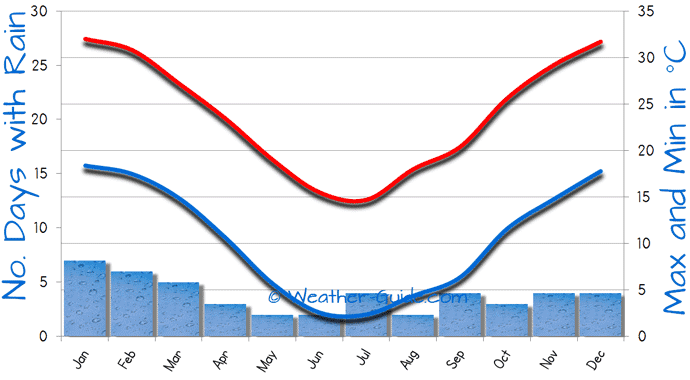 The bar chart indicates the number of wet days per month that Mendoza experiences. Mendoza lies on the eastern side of the Andes mountain range and is described as having an arid climate. The high mountains shield the region from a constant rainfall but the plains that surround the city are full of vine yards providing the grapes for the regions famed wines. This transformation from an arid landscape to a fine wine producing region is due to the extensive irrigation system. Weather-Guide.com, With Over 1,000 Pages There's Too Many To List Here!